Tasmania’s capital city Hobart lays claim to be the second driest state capital in Australia, after Adelaide. There are fewer frosts in the south than around Launceston in the north as Hobart is closer to the ocean. And as is to be expected in a cool climate, especially one where there is nothing between the south of the island and the Antarctic, proximity to sea level is important for vineyards to capture as much warmth as possible. Southern vineyards range from around 50 to 150m above sea level. By contrast, the highest vineyards in Pipers River in the north reach nearly 300m. 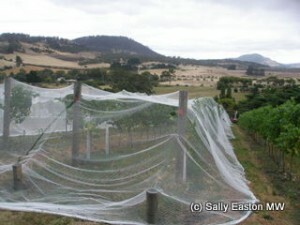 Whereas there are sizeable vineyards in the north and east of the state, southern Tasmania is largely the realm of small vineyards and family production. Vineyards are particularly tiny in the Huon Valley, south-west of Hobart and on the damp western side of Mount Wellington, which marks the start of the south west wilderness. This leaves the Derwent and Coal river valleys as the main vineyard areas, though Derwent has not many more vineyards than Huon. 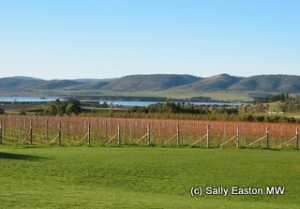 Both valleys’ vineyards are around half an hour from Hobart, which straddles the wide Derwent estuary. The Derwent’s upstream trajectory is the north-west, while Coal river is more directly to the north of the city. Derwent is colder, wetter and more vulnerable to frost than Coal river valley, a mere 25km further east. The valley is notably home to Moorilla and Stefano Lubiana Wines. While records show sparkling wine was made in southern Tasmania in the 1820s, it was in 1958 that the first vines of the modern era were planted at Moorilla Estate, which now lies in the northern suburbs of Hobart, and which is also now home to MONA, the controversial museum of old and new art. Tasmania’s wine history has many stories of vinous migrants searching out cool climate locales and the south claims a few of these. Sparkling specialist Steve Lubiana, a fifth generation winemaker from South Australia, moved to Tasmania as a result of his search for cool climate. The first hectares of his vineyard were planted in 1991, on north facing vineyards on the Derwent river, 20km from Hobart. A short hop over the hills is the Coal river valley which was opened up to agriculture after the river was dammed in 1983. It is warmest around Campania in the north of the valley, and this is where the 20-hectare Domaine A is to be found, arguably the only producer on the island who has regularly and successfully ripened cabernet sauvignon here since 1990. Domaine A’s owner Peter Althaus was another émigré looking for a cool climate location. He explained his choice of purchase “we have black cracking clays which retain heat. The Coal river valley is dry, the west and north-west winds are already dry and they warm up over the land. And in autumn we get a dry and warm north wind, similar to the Foehn in Switzerland,” Althaus’ original homeland. This is seriously marginal territory for Bordeaux varieties cabernet sauvignon and merlot, and vintage variation is a big thing, so Althaus always shows two vintages at cellar door so he can explain the differences in outcome. Warm-spot Campania is also home to two-thirds of Pooley Wines’ 12 hectares of vines, the first of which were planted in 1985. Varieties more readily adapted to cool climate were planted – pinot noir, riesling and chardonnay. The vineyards here are some 35 to 40km from the sea, and are protected from the cooling sea breezes. Their other patch of vines is nearer Richmond. It was also in Coal river valley that founding father Andrew Hood set up his own label business in 1990, one that also offered contract winemaking services to small-scale growers who had enough fruit for just a few hundred cases of wine. This business was sold to Frogmore Creek in 2003, and they are now one of the top five producers in the state, and the only one of those based in the south of the island. As well as their 30 hectares of vineyard, the company buys fruit from all over the island for their other labels. Such inter-‘sub-regional’ sourcing and blending is the norm in Tasmania for the larger producers. Some of the northern boys also source fruit from here for part of their sparkling base wines. The island state is, after all, a single geographical indication. But differences in style, and in some cases grape variety, are beginning to emerge. At the other end of the scale, small single vineyard labels are also gaining ground. Joining this throng are Shaw and Smith, for example, who just last year (2011), bought the 20ha Tolpuddle vineyard in Coal river, which had been supplying fruit for the likes of Hardy’s Eileen and Penfold’s Yattarna chardonnays.